Price: $12990 - Great Value, Bring Offers! 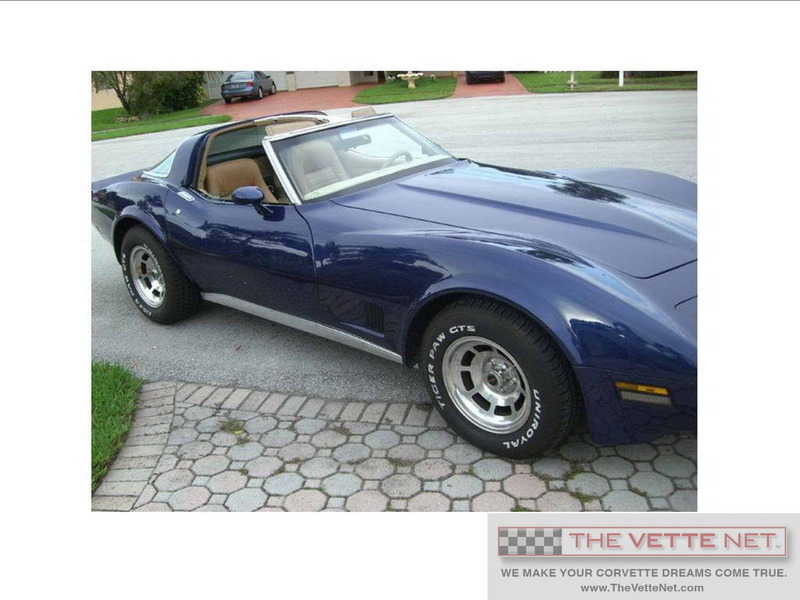 We are pleased to offer a 1981, the last of the carbureted engines available in Corvettes. This model sports a newer Blue paint job which is in very good condition and looks great, described as 8.5 quality. According to the trim tag, it was originally RPO 59L which identifies it as Cream. Interior is the correct Camel Leather, code 642. All new mats are present. It is equipped with power windows, power locks (disconnected) and AC which blows cold with a new Delco fan recently installed. All gauges work and benefited from a new circuit board. The t-tops were replaced by a one piece transparent acrylic top which adds a touch of custom. Engine runs strong and exhibits lots of power, transmission shifts smoothly. The vacuum operated headlights work as they should. Miles show 46K, but there is no proof that could be actual. Has the optional original Aluminum wheels with good tires (80-90% life left). New steering wheel (original will be included with sale of car). New power window switches and door handle trims. New retractable shoulder and lap seat belts on both driver and passenger sides. New aluminum wheel center caps on all wheels. New front and fuel door emblems. All in all, this Corvette is a fine example of a late Stingray in great condition both cosmetic and mechanic which will give you plenty of happy miles and lots of smiles. Located in South Florida, we can arrange delivery nationwide and international. Corvette trades are entertained. In business since 1998, THE VETTE NET has established itself as the premier source for buying, selling and leasing Corvettes, with thousand of enthusiasts assisted nationwide and international. We are fellow Corvette Club members, we drive Vettes, we live the life-style, and enjoy the hobby. Our Motto is "UnderCommit - OverDeliver" and we guarantee a pleasant and straightforward experience.